Monday evening marked the most important moment so far in the run-up to the June 23 EU referendum. Within the space of just four hours, three new opinion polls were published that all confirmed Remain’s worst nightmare: The pro-Leave swing is real and the probability of a Brexit is the largest that it’s ever been. Prime Minister David Cameron’s night of horrors began to unfold when an ICM poll conducted both over the phone and online indicated a six-point lead for Leave (53/47%). 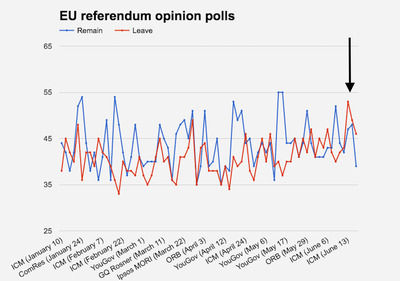 Shortly after, an ORB phone poll was released that showed a one-point lead for Leave (49/48%), and YouGov published an online poll of its own that gave Leave a commanding seven-point winning margin (46/39%). This is how last night’s polls affected Business Insider’s live opinion polls tracker. As the chart illustrates, support for a Brexit has been building steadily since mid-May. These results confirmed that a nationwide pro-Brexit swing is happening and has sustained over multiple opinion polls. The findings of the ICM’s research, in particular, ought to have the Remain campaign very concerned. 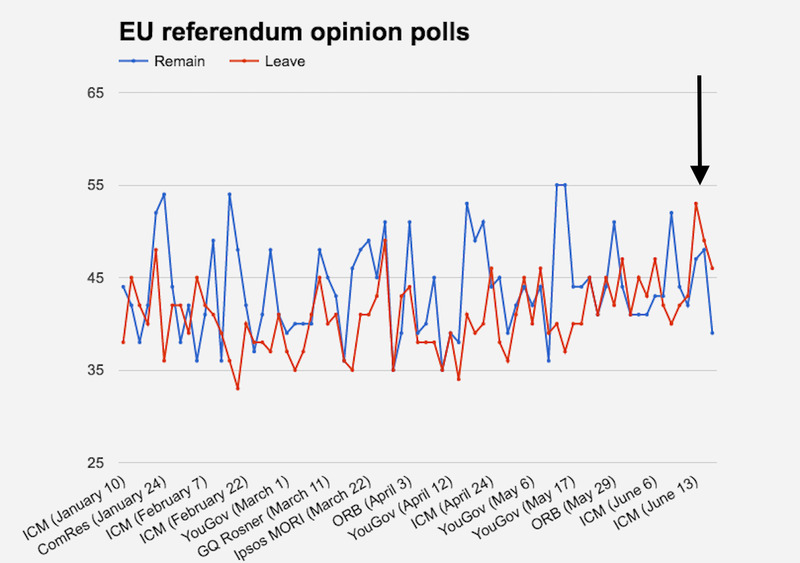 ICM’s last phone poll, published two weeks ago, indicated a four-point lead for Leave. However, the responses were collected over a bank holiday weekend. Phone polls conducted on holiday weekends in the past have produced very odd results, according to analysts. As a result, experts approached the findings with caution. The fact that ICM’s newest phone poll gave a lead to Leave shows that the pro-Brexit swing that the research group detected was not an anomaly and was the start of a very real shift in public opinion. It isn’t impossible that Leave’s lead was boosted by the Orlando attacks that took place on the weekend that the survey was conducted. Polling analyst Matt Singh told Business Insider that polls conducted immediately following major events sometimes produce overshoots. The new polls also showed that the phone/online discrepancy is disappearing. Up until recently, phone polls had shown comfortable leads for Remain, while online surveys had indicated a much closer contest, and in some cases narrow leads for Leave. But this trend appears to be a thing of the past. The two modes are converging and now Remain finds itself behind in the majority of polls regardless of whether a phone or the internet was used. To make things worse for David Cameron and the rest of the Remain campaign, tabloid newspaper The Sun called for Britons to vote for a Brexit on Tuesday. The newspaper has a famous record of backing the winning side in major political votes. On the day following the 1992 General Election, it printed a front-page with the headline “It’s The Sun Wot Won It” because it believed that its contribution to election coverage played a big part in the Conservative victory. The newspaper’s track record aside, it is the most read newspaper in the country. When The Sun makes a political point it reaches a lot of people. As Business Insider pointed out, just because public opinion is moving in the direction of a Brexit doesn’t mean that this result is guaranteed. In fact, according to bookmakers and polling analyst Matt Singh Remain is still the more likely outcome. But all the momentum is in favour of Leave right now and the timing could not be worse for Remain with the country voting in just over a week.